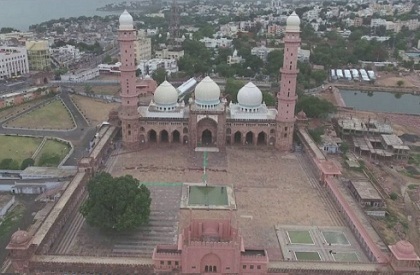 BHOPAL: The famous market on the premises of Tajul Masajid would start later this month, albeit with a delay of a few days, due to Assembly elections. But the confusion that had been created over alleged administrative interenfence, has now been cleared. Earlier, eyebrows were raised as a notice had appeared that this historic market would not be allowed on the premises. As it's Tajul Masajid's campus, a Waqf property, the suspected interference of officials--even though it was apparently a verbal order, led to panic and suspicion that it could be an attempt to grab control over land. However, this alarmed people in Bhopal. As a result, there was a strong opposition. Iv view of citizens' anger, there hsa been a clarification and officials have now said that there is no such order. The market would open from November 29. The market is known across the region as people wait for months for the shops, as it brings them goods from India and abroad. Woollens are sold as well in many shops and citizens wait for the entire year for it.